Mdina and Rabat are two popular localities in Malta (South West), and each admired for very different reasons. Mdina is one of the most popularly visited places by travellers because there’s no place like it anywhere. Sitting on top of a hill overlooking large parts of Malta, it’s a small town, rich in history and surrounded by tall bastion fortifications. It’s filled with centuries-old buildings that have been well maintained throughout the ages. Today Mdina is a major tourist attraction recognised internationally as an important UNESCO World Heritage Site (currently on its tentative list). Rabat, the village that neighbours Mdina, on the other hand, is known for its quiet, more rural character and natural beauty. Apart from offering a few key museums and points of interest, Rabat is also known for one of the few forested areas the country knows, at Buskett, the entrance to which can be found on the outskirts of the village. Neither of the villages are popular places to actually stay, although a few boutique hotels can be found. If exploring the country is your priority, it’s definitely a lovely location to consider staying in. If you decide to stay elsewhere, it’s an area to visit multiple times, for sightseeing but also to enjoy a beautiful part of Malta in the evening. Its main entrance features in the popular TV series Game of Thrones, scenes of which were filmed in different parts of Malta and Gozo. Mdina, also called the Silent City, is surrounded by fortified walls and sits on top of one of the highest hills of Malta. Built in Medieval times, much of its original architecture has been preserved and its narrow alleys tell tales of centuries of history and the various rulers that governed Malta. It may be on most postcards and is a must in all the painters’ portfolio, yet the sight of Mdina as you are driving up to Rabat is a view that does not fail to amaze every time. Standing proudly on one of Malta’s highest promontories, the it looks like a medieval walled city straight out of a fairy tale. It is an inspiring view; a city that hundreds of years after it was built still commands respect, awe, and curiosity about its tales. And what tales, innumerable and long-winding given the city’s long history. There’s a distinct feel you get when walking through these alleys and the views over large parts of the island from on top of the bastion walls are breathtaking and indicative of the area’s strategic importance to its various occupants. Once past the deep moat, nowadays a public garden, and inside the city’s walls, cobbled streets are lined with immaculately preserved noble houses, private chapels, palazzi, and cathedrals. The streets are narrow and winding, and walking along them feels like trying to find your way out of a maze; a feeling which adds to the element of surprise at finding large squares. Silence pervades, and is the perfect complement to a walk on the bastions, as well as taking in the panoramic view of most of Malta and the surrounding sea. Mdina and Rabat are located in a quieter part of the island, and once you leave the busier parts like Valletta, Sliema, and St. Julian’s it’s fairly easy to get there. The closest central localities to these villages are Attard, Zebbug, and Mosta, although major road signs in the central part of Malta will include Mdina. Right outside the entrance to Mdina, next to a playground, public parking is available, although it’s rare to find a spot here on busier days. A parking attendant is usually present and their income is based on gratuities (although paying them for parking there is not required as such). There’s a large paid parking area near the Roman Villa (museum in Rabat – more on that below) for starters. You can also drive through a narrow tunnel into the moat of Mdina from that location, with more public parking spots. You’ll often find a parking attendant here as well. Finally, there’s a road in the same place that leads down to what used to be one of the few train stations around in Malta (and is currently in use as a restaurant). On busy days, that road is my best bet to find a parking spots. If you’re staying elsewhere, the journey planner from Public Transport Malta will be of help to plan the best route for you. If you opt for a private taxi airport transfer from Malta International Airport, that will cost you around €22, while a shared shuttle bus will cost around €14 for 2 adults (both one-way fares). There isn’t an awful lot of choice when it comes to hotels in Mdina and Rabat, although there are a few very good options to consider if you’re looking to stay in a part of Malta that is less common. The Xara Palace is probably the most well-known boutique hotel in the area, situated in the heart of Mdina. It’s housed in a 17th-century palace and offers luxurious accommodation (with a price tag to match) with different levels of rooms (most with a great view as you can imagine). On the outskirts of Rabat, Maple Farm Bed and Breakfast offers high-quality lodging in a very quiet area that’s within walking distance to Rabat and Mdina. It’s a family run business which gets great reviews and loyal guests. You won’t find modern apartments (or buildings for that matter) within the walls of Mdina. Instead, you can find privately rented out houses of character: Authentic centuries-old residences that have been renovated and modernly decorated and furnished. Alternatively, Airbnb offers some really good (and affordable) options around Mdina and Rabat. It’s not just a good location to visit individual museums or points of interest, the city itself is something to behold and experience. A myriad of streets and alleys paved with stone slabs, surrounded by a blend of architecture styles introduced over the centuries all together make for an impressive place to admire. The museum is located to your right as you enter the Main Gate and is popularly visited. To be fair, the museum could do with a little work and part of the interest is in the building itself: Vilhena Palace. It’s a commanding building, with its beautiful baroque facade and impressive entrance courtyard. Right opposite the museum, the Torre dello Standardo formed part of the system of watchtowers around the Maltese islands, which together functioned as a communication system. To raise the alarm in case of attack, or to pass on the message, a fire was lit and visible to at least two other towers in the line of sight. This tower nowadays houses a small tourism information office but it’s worth having a quick peek inside. Easily recognisable in the skyline of Mdina, St. Paul’s Cathedral (Pjazza San Pawl, in the centre) with its baroque cathedral, bastions, and palaces, is an imposing landmark visible throughout central Malta, The Cathedral is the architectural heart of this elegant, walled city, and ties on the site of a much earlier Norman church destroyed by a violent earthquake in 1693. The rebuilt cathedral was decorated with various artifacts that survived the earthquake and can still be admired by visitors today. The floor are covered by large marble gravestones, commemorating the several bishops and canons, as well as laymen from noble families who were buried in the cathedral. Originally a seminary, the museum (located across the street on the side of the cathedral to the South) today is one of the most outstanding religious museums in Europe. A small chapel is found on the second floor exhibiting church vestments. It also exhibits an impressive cross-section of sacred art, famous paintings, a coin collection, Roman antiquities, and original documents from the time of the Inquisition. The silent city has always been the seat of the Bishop of Malta. The Archbishop’s Palace (next to the cathedral), which was built in 1722, serves as the residence of the Archbishop of Malta. Palazzo Falson (towards the end of Triq Villegaignon), generally known as the Norman House, is the best-preserved Medieval era building in Mdina. Built in 1495, it was occupied by the first Grand Master in Malta, Philippe Villiers de L’Isle-Adam. when the Knights of Malta arrived here in 1530. The ditch around Mdina were landscaped and upgraded in recent years, which makes it a great place for a little stroll. You can enter the ditch from the small parking area at one of the side gates (Greeks Gate), or from a staircase to the side of il-Veduta restaurant. After Grand Master Vilhena confiscated the original Ministerial Palace for his own use, the Universita (local government) found its new seat in this building. It sits at the edge of the square in front of St. Paul’s Cathedral During the revolt against the French, a national assembly came together here. You can get an excellent view towards the East of Malta from the bastion at Triq is-Sur, at the back of Mdina. Good for a quick peek or for a quiet spot to enjoy the silence and view on a summer’s night. Palazzo Gatto Murina, one of the earliest ‘Siculo-Norman’ structures (i.e. built between 1100 and 1530), was erected during the latter part of the 14th century. An audiovisual show “Tales of the Silent City” is housed inside the Palazzo. This is the palace of the oldest noble family of Malta and was originally built in 1370. The house contains numerous paintings and valuable documents. Be sure to visit the Chapel of St. Roque, located on Triq il-Villegaignon, the longest street in the centre of Mdina, just past the St. Paul’s Cathedral, coming from the Main Gate. What looks like a quaint little church from the outside hides a beautiful interior that is worth admiring. No longer used for liturgical services but opened to the public during the day, the church of St. Roque is definitely worth a quick visit, whether you’re religious or not. The Mdina Experience (Pjaza Mesquita) and Mdina Dungeons (right behind the Main Gate) are heavily advertised tourist attraction. The first is a short historical movie, which is pretty static but informative for those who have a keen interest in Mdina’s history. The second is generally found not to be worth the €5 entrance fee, however. If you think Mdina’s a nice place to visit during the day, it’s even nicer in the evening after the sun sets. It’s a lot quieter and the dimly lit streets create even more of an atmosphere. It’s also a great excuse to try out a few of the nice restaurants inside Mdina and at Saqqajja Hill, just outside the Main Gate. Howard Gardens are one of the biggest public gardens in Malta and can be found right outside Mdina. These gardens form a natural border between Rabat and neighbouring Mdina. There are a few kiosks around with tables and chairs and it’s pretty peaceful and quiet there. Great for a lazy Sunday morning coffee and snack. The Maltese islands are rich in late Roman and Byzantine burial sites. Both sites contain a typical complex of interconnected, underground Roman cemeteries that were in use up to the 4th century AD. St Paul’s Catacombs represent the earliest archaeological evidence of Christianity in Malta. Both sites are accessible from the middle of Bajjada Triq Sant Agata, in the village core of Rabat. The mosaic pavements in the ‘Roman villa’ at Rabat rank among the finest and oldest mosaic compositions from the western Mediterranean, alongside those of Pompeii and Sicily. They were discovered in 1881 just outside Mdina in the remains of a rich and sumptuously decorated town house of the Roman period. Once home to one of the Chaplains of the Order of St. John, the Wignacourt Muesum (Triq il-Kullegg, around the corner from the Paris Church of St. Paul) is a well-preserved representation of what life was like for the Chaplains of the day. Named after Grand Master Alof de Wignacourt, the museum is well worth a visit, for its magnificent setting and beautiful baroque architecture alone. At the museum of Casa Bernard (46 Triq San Pawl) you can catch a glimpse of how Maltese nobility lived in this well-kept and beautifully restored 16th Century Palazzo. Passed on through generations, descendants from its original owners actually still live there. Guided tours are offered and it makes for a very unique place to visit. Fontanella is a cafe located inside of Mdina that is known for its delicious selection of cakes. Offering a beautiful view from atop the edge of the bastions, it’s a nice stop for a coffee and snack and is a popular establishment locally. Crystal Palace (aka is-Serkin) is a small everyday bar across the street from the Roman Villa, known as selling some of the best pastizzi (a staple of Maltese food) on the island. The Medina is one of the few restaurants in the area to serve fine dining, within an old building inside the walls of Mdina. Food and service of a high standard with a lovely setting to boot. Trattoria AD 1530 at the Xara Palace is a restaurant that’s open for both lunch and dinner and serves high-quality food. It offers tables outside under a canopy (which is heated in winter), right around the corner from Mdina’s main gate. One of my personal favourites in the area. The Fork and Cork is a fairly recent addition to restaurants in the area but is already one of the best-rated establishment. It serves excellent food and offers a good choice of local and foreign wines. 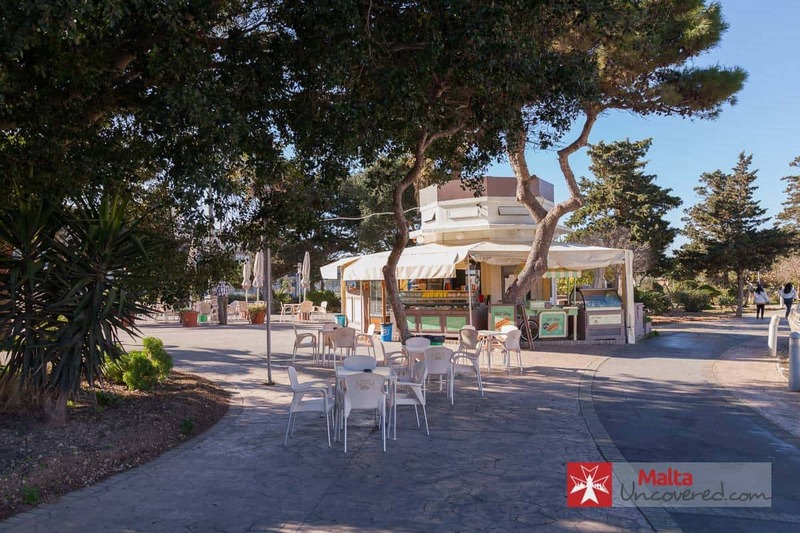 Take a quick tour of the area with a small train that drives around, starting from in front of the Roman Domus or explore the area around Mdina (the moat) and il-Buskett (forest area) on foot. Take a karozzin ride within the narrow streets and alleys of the silent city itself to admire the serenity and beautiful architecture. Rabat is one of the few villages in Malta where multiple village feasts (or festa) are celebrated, honouring different saints. Attend one of these festi in early April, early June and early July to soak up the atmosphere and enjoy the fireworks displays and music. Take home a couple of traditional souvenirs in the form of Maltese lace and decorative items from Mdina Glass in the long central road Triq il-Villegaignon inside Mdina. Around in April? Attend Medieval Mdina and see the Silent City come to life with re-enactment and other activities in one of the most popular annual events in Malta. Love wine? Try one of the wine bars/restaurants on the hill approaching Mdina and Rabat (Telgha Tas-Saqqajja), like Tat-Tarag and The Fork and Cork. Both have tables and chairs set outside with a nice view. Great place for wine lovers to share a bottle and food together with good company. Punic remains have been found in the area around Mdina and suggest that Phoenician settlers inhabited the region around 700 BCE. Historians believe that even they fortified the city they then called Maleth. The location was of strategic importance, situated on one of the island’s highest points and relatively far away from the sea. The Romans also recognized Mdina’s strategic importance and developed the city further, also building the Roman Governor’s palace there. It was during the Norman conquest of Malta in 1091 AD when the city’s outline was shaped as we know it today. Its thick surrounding fortifications and wide moat were constructed by the Normans and much of the architecture dates from medieval times. Mdina is one of the few great architectural treats in Malta that did not result from the activities of the Knights of Malta. The oldest city on the island, going back to prehistoric times, the word Mdina derives from the Arabic word ‘medina’ which means ‘city’. The Arab legacy continued even though the Arabs were officially expelled from Malta in 1250 when the Islands were under Christian rule. Thus, the name survived even though the city was referred to as ‘Civitas’ (city in Latin) or ‘Citta Notabile’. The city was fortified in medieval times, but its protection in early times must have been its high location on a rocky crag. It is certain that either during the Byzantine or during the Arab occupation of Malta, the fortifications were retracted to the present proportions, perhaps for better defensibility. A strong earthquake destroyed parts of Mdina in 1693, after which the Knights of Malta rebuilt the cathedral and erected buildings such as Palazzo Falzon and the Magisterial Palace in Baroque style. The fortress city, once extended to the adjoining town of Rabat. Yet the fortified city was subsequently downsized in order to defend it more effectively. Mdina was Malta’s capital city until the Knights of Malta arrived in 1530, who built their headquarters in Birgu (Vittoriosa), which subsequently became their Administrative hub. Do you have any tips/reviews to share about Mdina? Leave a comment and let me know! Thanks for chipping in that tip Patrick. I haven’t listed in the article for that very reason. Hi Edward, I plan to go Blue Grotto in a Saturday morning followed by Rabat and Mdina. Is that too rush? Please advise the best route if possible. Hi Joe, I wouldn’t say so, no. I’d go to the Blue Grotto earlier in the morning, say at around 9am as that’s when most boat tours start their day, it’ll be quieter and the early sunlight is beautiful inside the cave. I’d head to Rabat first for a stroll around town and maybe visiting a few museums if you’re in the mood for it, then a late lunch in Mdina at Xara Palace and an afternoon coffee or tea at Fontanella, after wandering around and exploring the Silent City. I wouldn’t want to recommend a specific route simply because both towns are pretty small and part of the fun there is finding your own way around in my opinion. I hope you enjoy your day! I was thinking about spending our last day/night in Mdina-Rabat in order to enjoy the evening there. It seems though that there is going to be little accomodation and resturants, is that so? Will it be better to just enjoy Mdina during the day? Thank you for your advice. Hi Beatrice, there are only a few options for accommodation in the area (best bet is Airbnb probably), although you can find a good choice of nice restaurants around and dining in the evening is still pleasant. Just got back from a lovely week in Malta! Stayed at Maple Farm B&B, complete with swimming pool, though we were not brave enough to use it in March, on the edge of Rabat. The owners even hired a wheelchair for me and took us on a tour of their olive grove and vineyard. The restaurant Fork and Cork in Rabat was brilliant: Masterchef meets Maltese cookery without the fancy prices. Generally Maltese portions elsewhere were huge. Bacchus in Mdina was another good restaurant and we enjoyed listening to the locals practising their band music at the David Adams d’Isla (not sure about that name) in Rabat, just across the road from the Castelleti which we didn’t have time to try out. We could have spend a fortnight just exploring Rabat & Mdina, Don’t go to Valletta on Sunday. All the tourist traps are open but many of the attractions are closed, also no smart cars which I was hoping to use as I have limited mobility, which meant I could only explore the pedestrianised flat ares near the entrance. Keep on with the good work! Happy to hear you enjoyed your stay Catherine, it is a lovely area. I like recommending Maple Farm B&B – you’re not the first to tell me they’ve gone out of their way to make their guests’ stay a comfortable one.